Body hydrators are vital, especially as we get older, in order to look after our bodies and maintain hydrated, healthy, glowing skin all over, not just our faces. I make sure to apply a body cream, lotion or oil every evening. Every so often I also use a body scrub or a dry brush to really exfoliate my body. Hydrea started off as a small business and then officially launched as a company in 1996. They focus on the old traditions of sponge finishing. To this day they continue to run their old warehouse in Tunisia. Cactus Bristle: It is the firmest type of bristle available. This type of bristle is best used dry. Hydrea use Mexican Tampico, which is a type of Cactus which is firm, low flex and has thicker fibres which improve with age. It exfoliates my skin without aggravating it. 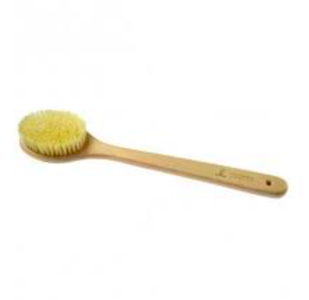 This is a great body brush made from FSC certified sustainable beechwood. 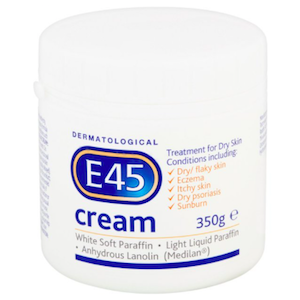 For 60 years E45 has focused on treating dry, itchy skin with eczema, psoriasis, ichthyosis, and other dry skin conditions. White Soft Paraffin: Moisturises the skin and helps protect skin from irritants. Anhydrous Lanolin: Prevents dry, rough, scaly, itchy skin and minor skin irritations. It is also a great moisturiser. Treats and soothes dry, flaking, chapped skin. It also quickly absorbs into the skin. 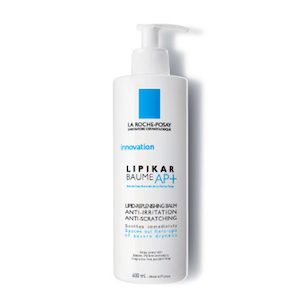 La Roche Posay is a brand that works in partnership with dermatologists. They create products for highly delicate and reactive skins. Niacinamide: Helps with the appearance of enlarged pores, uneven skin tone, dullness and a weakened skin surface. Rapeseed Oil: Contains fatty acids and antioxidant properties. It helps to moisturise the skin and prevent dry, itchy skin. A body moisturiser suitable for eczema prone skin. It is also suitable for babies. Omega Pharma is a french pharmacy brand. 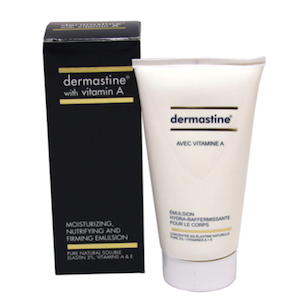 This brand has extremely high dermatological control on the effectiveness of their products. Menthol: Produces a cooling effect by blocking the calcium current along the nerves responsible for detecting temperature. Horse Chestnut Extract: This can reduce some symptoms of poor blood circulation, such as varicose veins, pain, tiredness, swelling in the legs, itching and water retention. This cream helps with heavy tired legs and blood circulation. 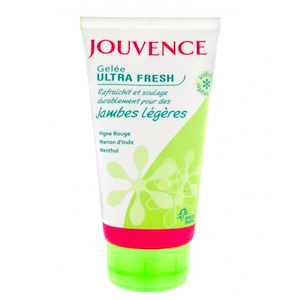 Upon application it soothes and relieves the legs. A South African brand recommended by doctors to treat scarring after surgery owing to the Vitamin A and Vitamin E contents. Vitamin A: Encourages healthy skin cell production. Vitamin A also stimulates fibroblasts, the cells responsible for developing tissue that keeps skin firm and healthy. Moisturising & firming cream that helps improve skin elasticity & suppleness. 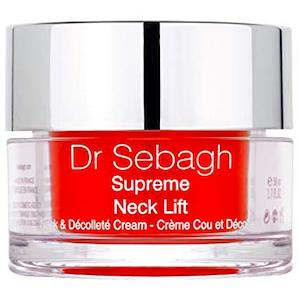 Founded by Dr Jean-Louis Sebagh and his team of fellow doctors. His main focus is to achieve face and neck lifting with cosmetic medical procedures. Watermelon Extract: Rich in Vitamin C, amino acids and lycopene, watermelon extract is a powerful antioxidant that is great for sun damaged skin. Sesame Seed Oil: It is both antibacterial and anti-inflammatory. Sesame seed oil is rich in minerals like copper, calcium and magnesium. Rich in antioxidant and nourishes the skin. This cream lifts and firms the skin all over. It also leaves the skin deeply moisturised, supple and radiant. Increases elasticity and firmness. Founded by Linda Rodin. She spent over a year exploring oils around the world. She then created her signature Jasmine and Neroli elixir in 2007. She personally approves every batch that is made. Jasmine Oil: An anti-inflammatory oil. It can help in treating dry or dehydrated skin, eczema and dermatitis. Neroli Oil: It is antibacterial, anti-inflammatory and antiseptic. Maintains moisture levels and balances skin. 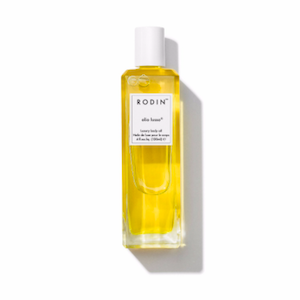 This body oil is comprised of 11 luxurious oils. It is deeply nourishing and leaves the skin looking radiant and supple. Established in 1987 in Melbourne. 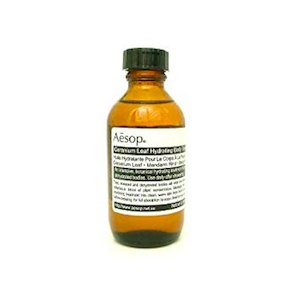 Aesop focus on investigating both plant based and laboratory made ingredients. Geranium Leaf: This leaf is anti-inflammatory, antiseptic and antibacterial. It used to be used in ancient herbal remedies for treating wounds, cuts and injuries. Mandarin Peel Oil: This oil promotes better blood circulation which is great for the skin. This body oil is a new favourite. It is extremely hydrating and is boosted with anti-oxidant Vitamin E. It contains skin softening oils of sweet almond and macadamia nut.